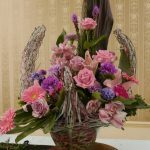 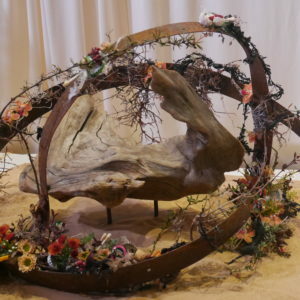 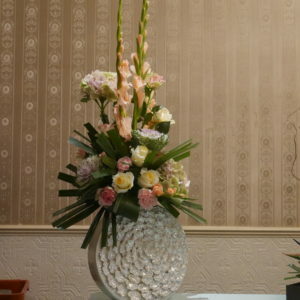 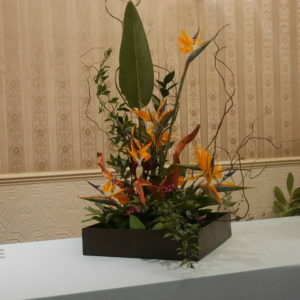 Throughout the year there are eight meetings where demonstrators create five designs which are then raffled to the members and visitors. 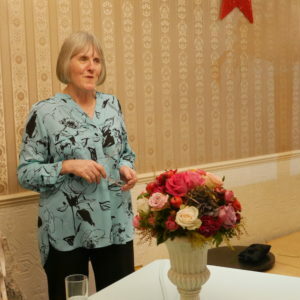 Demonstrators may be local or part of a touring national team. 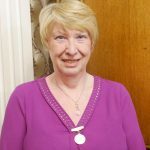 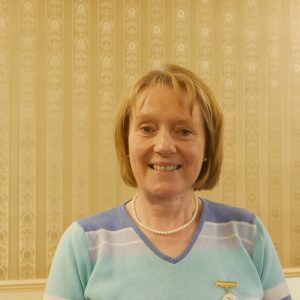 Our Chairperson Freda Scott and all members welcome visitors to our meetings and hope you enjoy your evening. 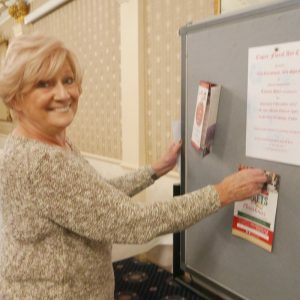 Raffle tickets are available at the door and cost 50p a strip. 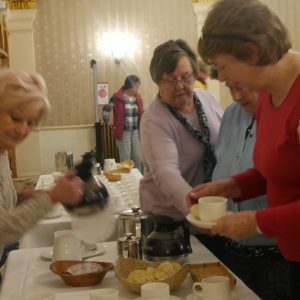 Tea and coffee is available after the demonstration so you have a chance to catch up with your friends. 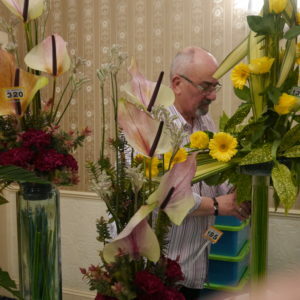 Steve’s demonstration utilised a variety of glass containers, each arrangement was accompanied by interesting and informative facts about the propagation of the flowers. 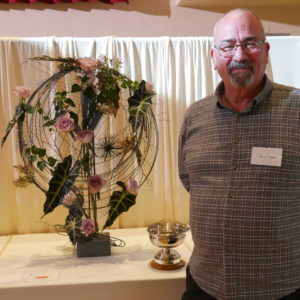 Steve was also presented with the trophy he won during SAFAS Autumn show. 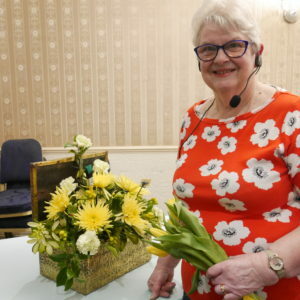 Christine cheerfully entertained members and visitors during our AGM with her demonstration of ‘A Brush with Colour’ and hilarious stories from her experiences as a demonstrator. 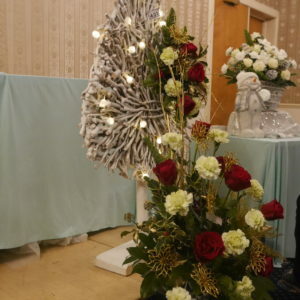 Audrey shared her favourite Christmas memories with her innovative designs. 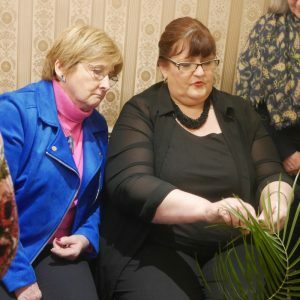 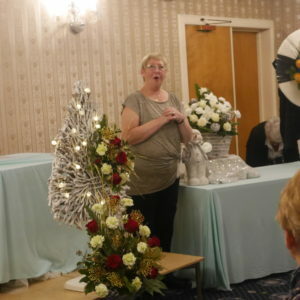 Kathy’s ‘Here comes Christmas’ demonstration was warmly welcomed by all who attended. 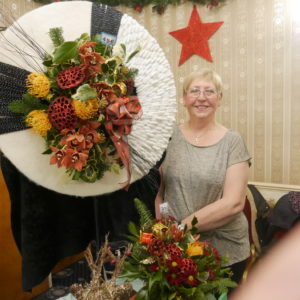 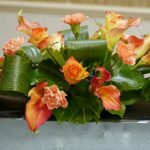 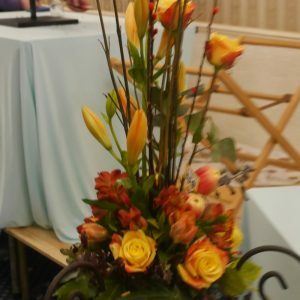 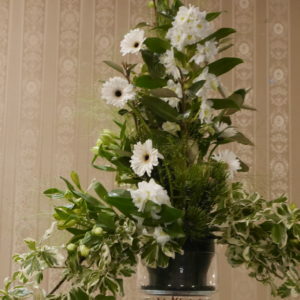 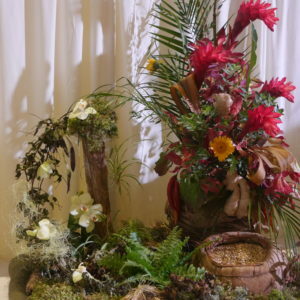 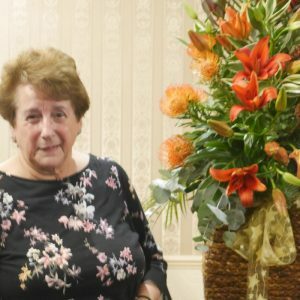 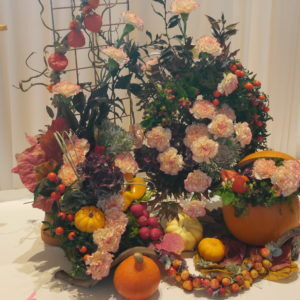 Kathy related many warm and funny stories as she created her seasonal arrangements. 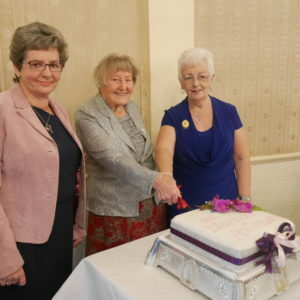 A fantastic celebration to mark our 60 years took place on Sunday 28 October. 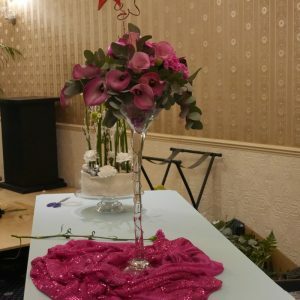 here are a few of the photos taken on the day. 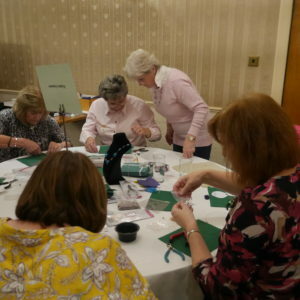 16 October 2018 -‘Hands On’ Members Night an opportunity to see and do it for yourself. 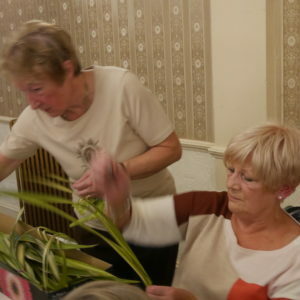 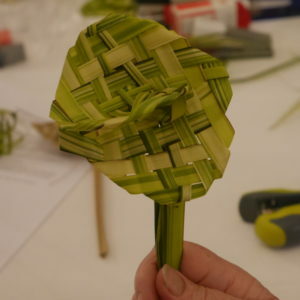 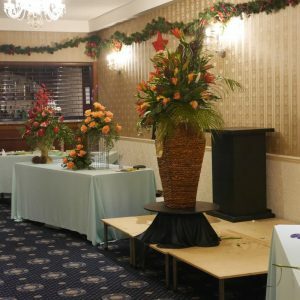 Members really enjoyed trying out new skills, Foliage Manipulation, Christmas Floral arrangement, Jewellery Making and Iris Card folding. 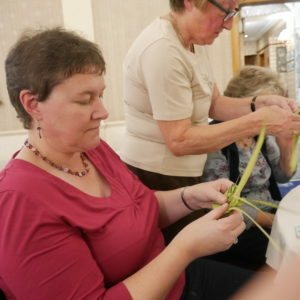 The pictures below show the concentration!! 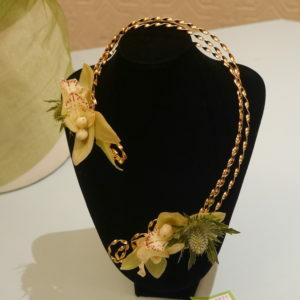 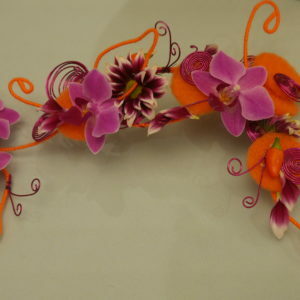 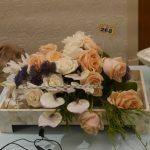 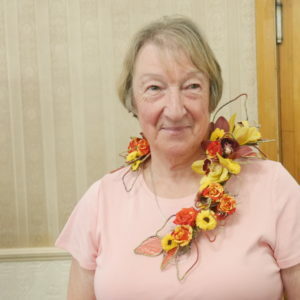 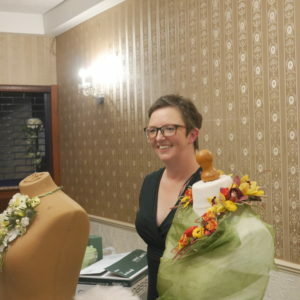 Gillian vowed us with her creative wearable floral arrangements, lots of stories and many laughs. 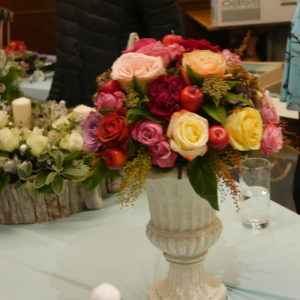 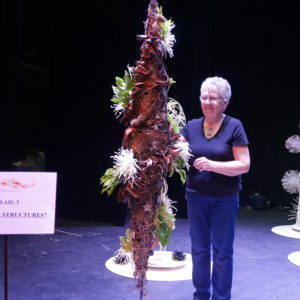 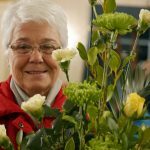 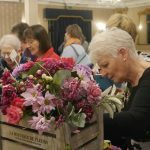 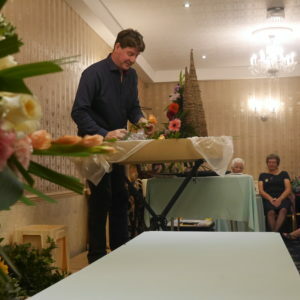 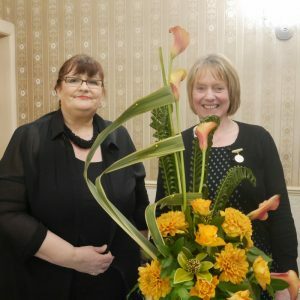 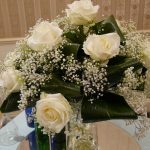 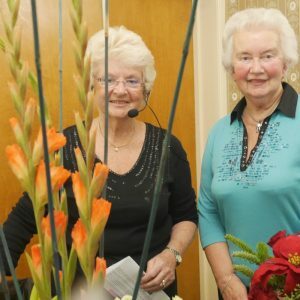 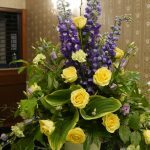 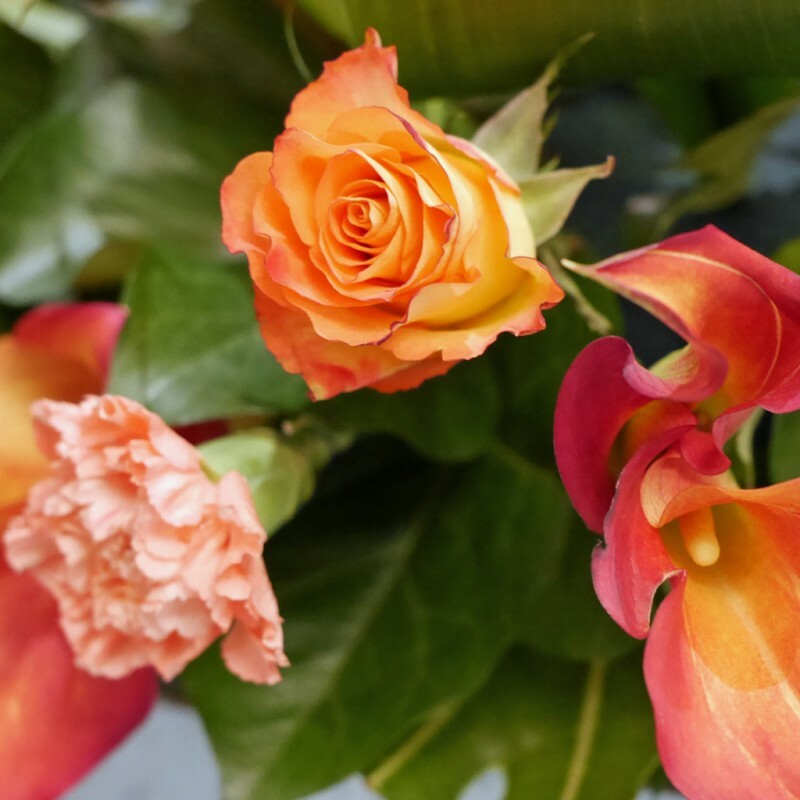 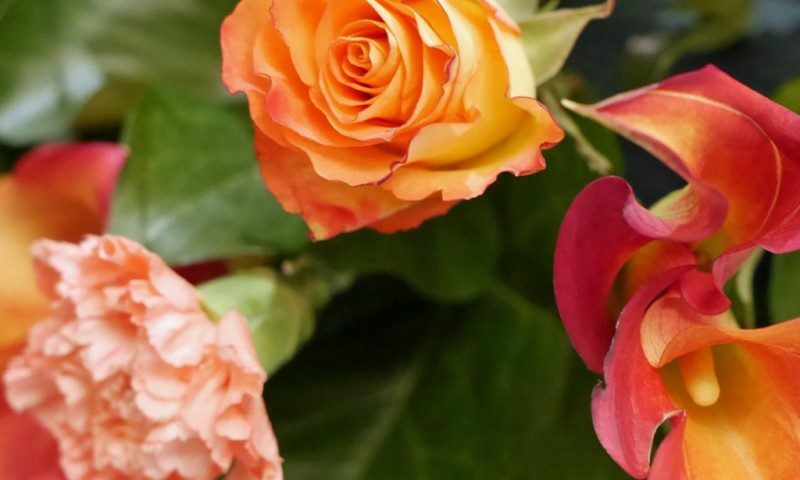 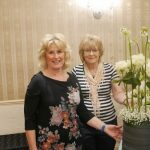 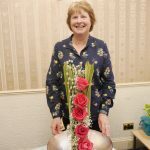 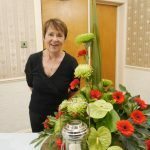 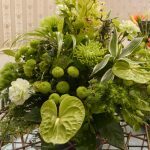 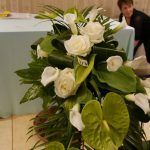 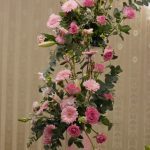 Gill had us all in fits of laughter with her entertaining delivery of her floral arrangements ‘Inspirations’. 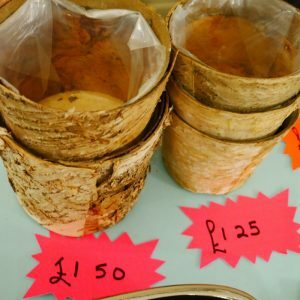 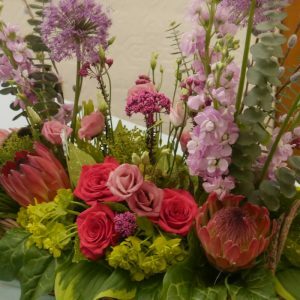 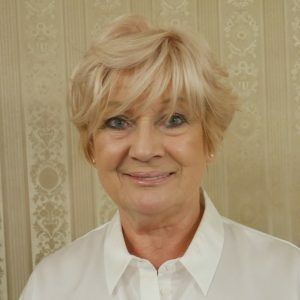 Gill shared memories of the holidays, people and occasions as her arrangements took us on a journey to The Rockies, fishing on the Spey, South African whale watching, hippos outside her tent and sampling vineyards. 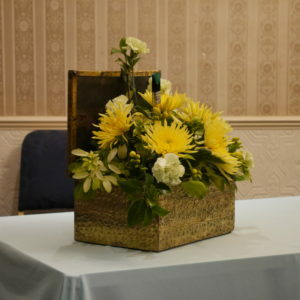 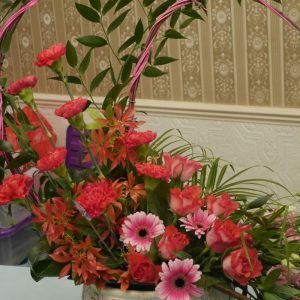 Mrs Alyson Christie from St Andrews entertained members and visitors with her gorgeous arrangements-here are a few. 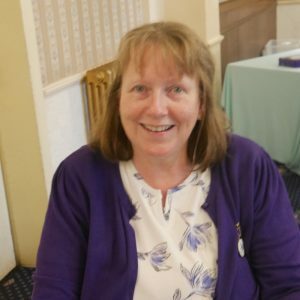 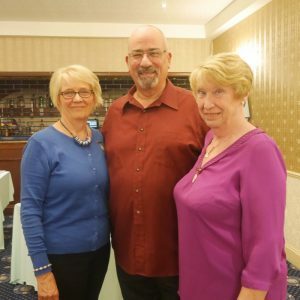 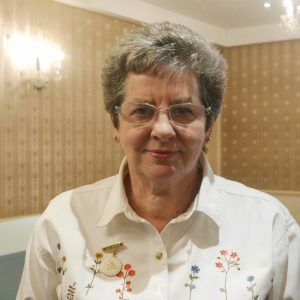 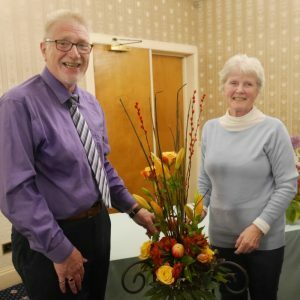 We had a very successful AGM, with business and appointment of new office bearers completed at the start of the evening followed by a highly entertaining demonstration from Karina Murray who entertained us with stories of both preparing exhibits for shows and then as a show judge. 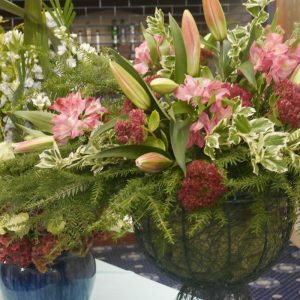 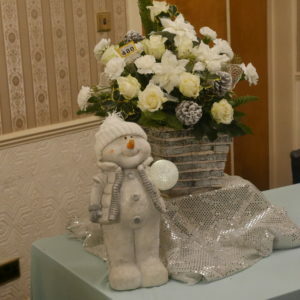 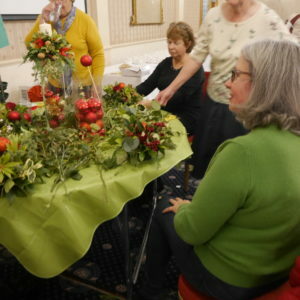 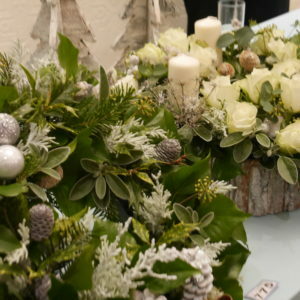 Members thoroughly enjoyed Linda Souter’s seasonal arrangements, along with our Christmas punch and hamper raffle. 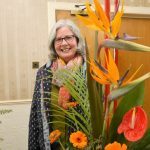 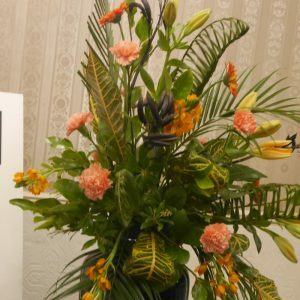 Joan Robinson, from Wigan entertained members and guests with inspirational designs based on her travels to Bangkok, Hong Kong,Dubai and Japan. 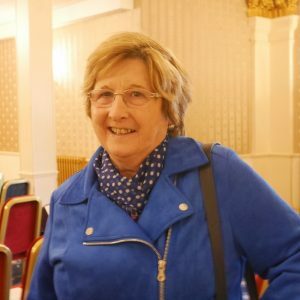 Joan is on her first tour to Scotland. 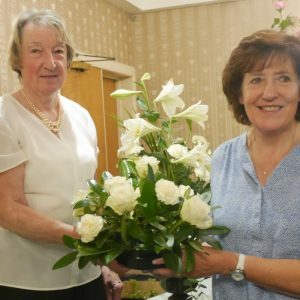 Club members wished her well for the rest of her tour. 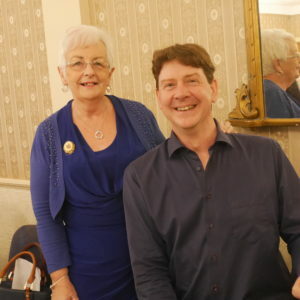 This meeting included our bottle stall to aid club funds. 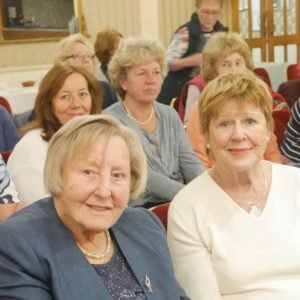 Many a lady left with clanking bottles in their bag !! 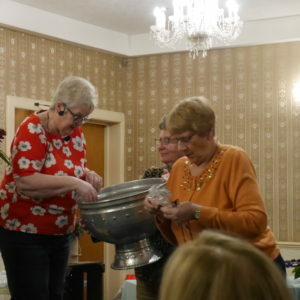 And as always our monthly raffle, news board and a well deserved cup of tea. 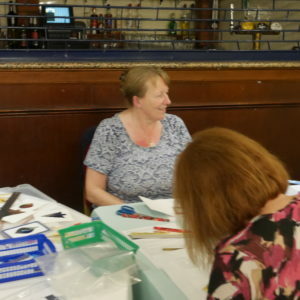 Meeting of 19 September-Due to the sad loss of Mrs Peggy Reid, Cupar -a SAFAS demonstrator and a dear friend of our club and also of Alyson Christie who had been due to demonstrate for us -Alison’s demonstration ‘Touch of Artistic Licence’ was replaced by ‘Here we go again’ by our own Anne Buchan. 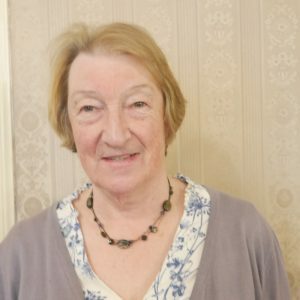 to glycerine beech leaves -empty one bottle of glycerine( available to purchase from chemists) into a bucket then fill the empty bottle with luke warm water (X2) and add to the bucket- mix well and then add your beech leaves- Ladies there is not a lot of time left to successfully do this year but if you are going to try Anne suggests you uses short stems-be patient though this process takes time- good luck! 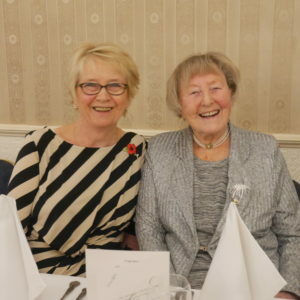 Some of our club members who enjoyed the evening. 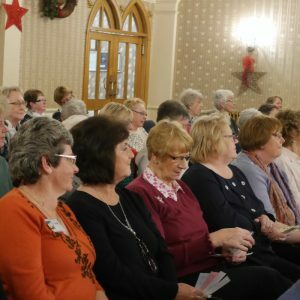 Members and visitors were entertained with Mary’s stories about her training and life as a nurse. 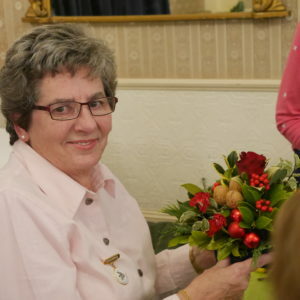 Mary also informed and quizzed our knowledge of the medicinal powers of plants and flowers. 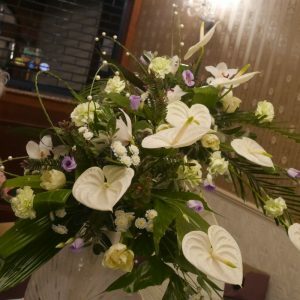 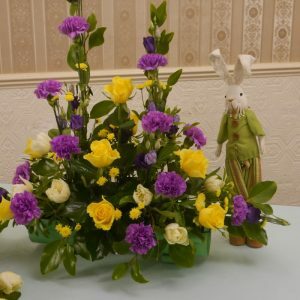 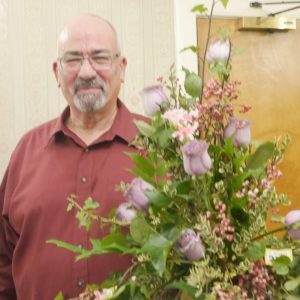 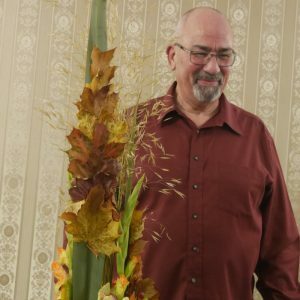 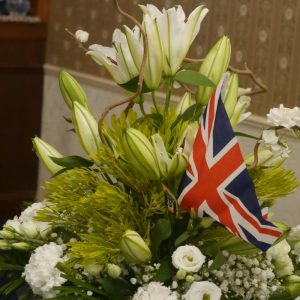 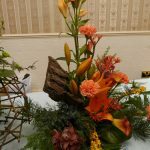 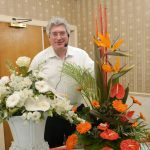 Derek Morgan who is currently on tour entertained us with tales of his time working for the Forestry Commission while making these lovely arrangements. 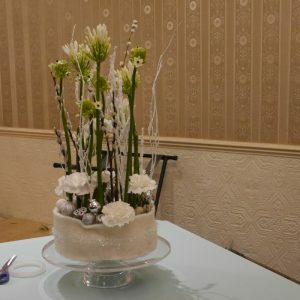 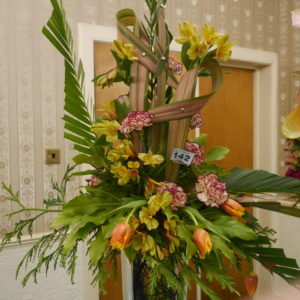 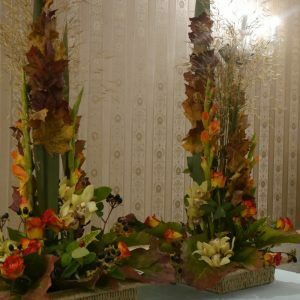 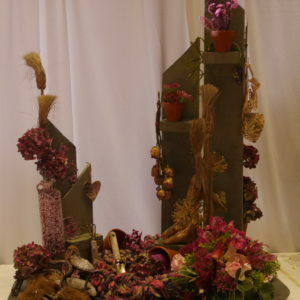 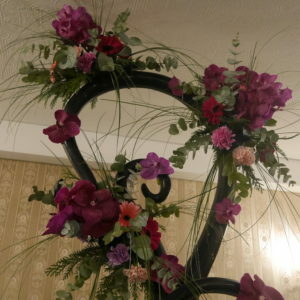 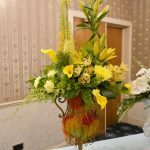 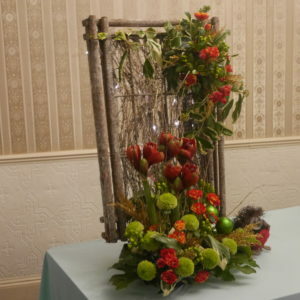 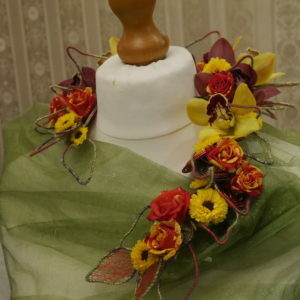 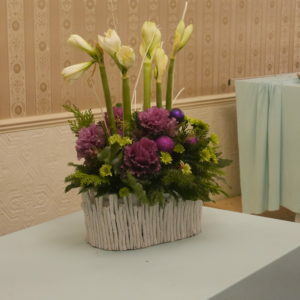 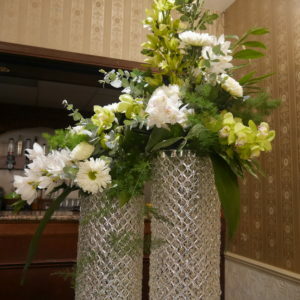 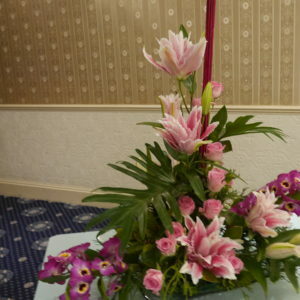 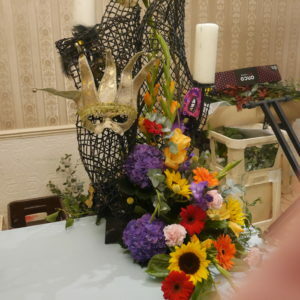 Marie Rutherford was our demonstrator and created these arrangements.